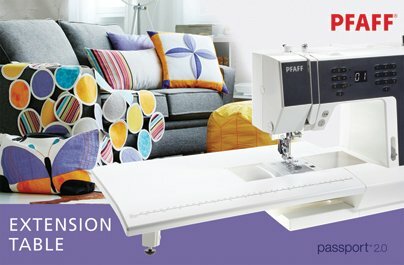 The Pfaff Passport 2.0 has been unveiled! Are you looking for a lightweight travel machine which you can take to retreats, classes and clubs? The Pfaff Passport 2.0 is only 13.9 pounds -- just one machine on the market is lighter than that!! Don't want to sacrifice some of your favorite features? Start/Stop functionality for sewing without a foot control! It has an optional Extension Table (pictured) which comes in a soft-side carry case designed to attach to the machine's include hard-cover case. How brilliant is that! The ladies who attended this year's conference were blown away that this little machine had all this ... and still felt like a real full-sized Pfaff as they sewed on it. This is not a toy, or a stripped down model to make it light. It's a real sewing machine, for real serious (mobile!) sewers. It's also an excellent machine for someone who knows they want to pursue sewing, but maybe doesn't have a lot of room to store a machine, or is concerned that they'll outgrow a more basic machine. No one will be outgrowing this machine anytime soon! And even if someone does want to grow into an embroidery machine, this machine is still the perfect mobile backup. We have only 13 on order, and they aren't here just yet but when they do arrive we don't think they'll last long.